I own a couple of Levithan's book, so I decided to start with his debut! Paul is a high school boy, who has always known that he was gay. Even his kindergarten teacher picked up on it, writing on his report card that he was "definitely gay." Of course, he didn't know what that meant but just knew that he liked boys. He "came out" to his BFF Joni in second grade, and he was the first openly gay Class President in third grade. His family is very supportive and he's very comfortable in his own skin. For Paul's friend Tony, things are quite different. Tony's parents are very religious, and he has to lie to his parents about his friends and himself in order to have a social life. Tony's parents would never let him hang around a gay friend, so even Paul's sexuality is a secret. Tony is also gay, but his relationship with Paul is strictly platonic. As far as Tony's parents are concerned, he is in a bible study group with Paul and Joni. 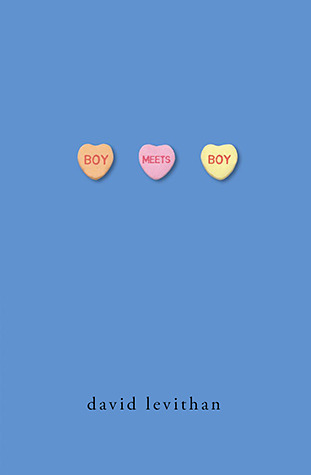 Paul meets a boy named Noah, and he become smitten with him. At first, Noah is much the same way but then he pulls back as he is "once bitten, twice shy." Paul was willing to deal with that, but then he goes and does something stupid like kiss his ex-boyfriend. So, the majority of the story has to do with Paul trying to win Noah back. The Paul/Tony/Joni trio becomes fragmented when Joni starts dating a new guy, and she doesn't have time for her friends anymore. Meanwhile, Paul and Tony miss her and need her...Tony especially, given the tough time he's having with his family. He wants to be able to be open and honest with his parents about who he is, and he's afraid that his parents won't be able to deal with it. He wants their acceptance so badly, and it was just heartbreaking to read. He could have been rebellious and just done his own thing anyways, but it was so important to him to be true to himself but also have his parents' blessing. For me, this secondary storyline about Tony was my favourite part of the book. If you are looking for a diverse book to read, this one is it! The football team's star is also a drag queen, and I loved how Levithan created such an interesting cast of characters and -- most importantly -- their acceptance of one another. If only people in the real world were so non-judgmental and open-minded. It definitely gave me food for thought. I really enjoyed this book, and I look forward to reading more of this author's work. 4 stars!! It was really good, and you should put it on your TBR list if you enjoy books with diverse characters. Love your review! This one sounds great!